We are "The stroker kit experts." We carry more stroker kits specifically for the Big Block Mopar engine than most other shops have for big and small block Chevys combined!! Whether you choose the Mustang munching 500 cubic inch kit, or the Camaro crunching 543, you'll find no other shop even comes close to offering such a large choice of in-stock kits, including such high quality components, at an incredibly reasonable price! We've been selling our kits for over a decade, we have many thousands of them running in all 50 states, and over 15 countries around the world, rocketing doorslammers as fast as low 8 second quarter mile times, and dragsters deep into the mid 6's! Listed on this page, you'll find an unbelievable DOZENS and DOZENS of different stroker kits available, ALL for the big block Mopar engine! Every single one of 'em normally kept on the shelf and ready to ship, usually within 24 hours. And, we are offering ANY of our American made Platinum Series Fully Forged lightweight pistons (four digit part numbers) in Flattop, Dished, or even Domed included as standard in our kits for the standard price! Choose any bore size, any compression ratio, any stroke crank, any length rods listed on this page and we'll include 'em in the kit for the standard price. You want it, you got it! No hidden upgrades, no "special order" extra charges, no BS and no sales talk. You won't find anything listed on our entire website as an unspecified "additional fee," or some other vague excuse for an answer. It's all spelled out below in detail. Want to shop around and do your research? No problem. Take your time. When you've got great quality parts at a very competitive price, you don't have to resort to high pressure sales. You'll end up calling us back in the end, and we know it! Check out our Customer's Rides page or talk to our customers running ten, nine, eight and as fast as MID SIX SECOND quarter mile times with same parts we supply in every stroker kit! You can't argue with these types of quarter mile times, and these types of RESULTS! We race Mopars ourselves, and we got tired of our pocketbook being dragged across the coals every time we needed an engine part that was made to fit a Mopar instead of a Chevy. So now we're doing something about it! In EVERY kit, we include everything you need, crank, rods, pistons, pins, locks, Clevite main bearings, Clevite rod bearings, Total Seal file fit moly rings, AND precision final balanced, all for just $2249!!. We make sure that EVERY specific piston and EVERY specific rod used in our balance jobs are weighed to verify they are within our spec. We then figure your exact bobweight and balance the crankshaft to that exact bobweight. We do not just use what's "written on the box" or any "estimated" weights for any part of the balancing operation. Check out our BALANCING SHOP! BRAND NEW FORGED 4340 steel PLATINUM SERIES crankshaft. Non twist forging. Induction hardened, CNC Machined. Plasma gas nitrated. Standard size rod and main journals. Rated to 1000+ horsepower. Includes lots of other features you won't get with the other guys such as profiled (rounded) counterweights, .125" full radiused journals and more. 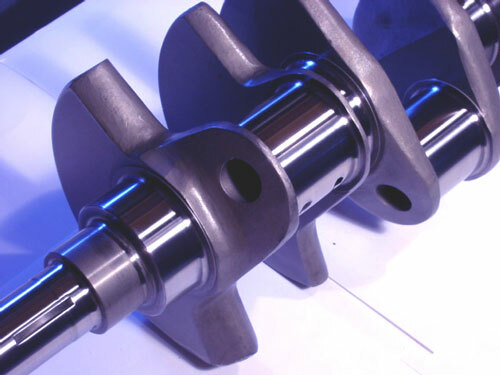 For some really in-depth pictures and manufacturing specs, check out our crankshafts page. Super light and strong PLATINUM SERIES rods. Made from aircraft quality 4340 Steel, fully SAE certified. Heat treated, X-rayed, and shot peened, and finished on American made SUNNEN equipment for super tight tolerances. Setup for full floating smaller and lighter .990" pins. All our rods come with nothing but insanely strong American Made ARP 7/16" bolts. They include lots of other features you won't get with the other guys such as the correct big end width (for proper side clearance) reduced shoulder profile for easier stroker clearancing, and more. For more detailed pictures, specs, bolt information, etc, check out our connecting rods page. All rods come standard with ARP 8740 bolts (which ARP rates up to 850 horsepower,) or you can upgrade to ARP 2000 bolts, which they rate up to 1200 horsepower. Our premium 100% forged Platinum Series pistons are made from the same aerospace quality 2618 T-6 aluminum billet as the high dollar name brands. They have incredible strength without sacrificing light weight. Our factory is fully ISO9002 and QS9000 registered, to ensure the highest standards of quality, and they're American Made from start to finish! Forged in America, 100% CNC machined in America. They feature drilled oil returns, tight quench, reinforcement ribs on the underside of the forgings, diamond finished skirts to tolerances of +/-.00025" (two and a half ten-thousandths of an inch! ), and the other high-end features you'd expect from a 100% American made lightweight forged piston, except the high price. All pistons use 1/16, 1/16, 3/16 ring pack for less frictional loss, and weight saving .990 pins, full floating and held securely in place with included SpiroLox. All include matching chrome moly heat treated, centerless ground pins. Many applications are available in Flattop, Dish or Dome for nearly any compression ratio, and at most all common bore sizes. Our original kit, and still one of our best sellers. Includes our Platinum Series 4.15" stroke BRAND NEW FORGED 4340 steel nitrated crankshaft with profiled (rounded) counterweights, and original Chrysler sized standard/standard rod and main journal sizes (2.375" rods and 2.750" mains.) Rods are our super light Platinum Series H beam 6.760 rods with American made ARP 7/16" bolts, and your choice of flat top, dished or Domed premium forged 2618 T-6 US made racing pistons, and full floating .990" pins. With most of the piston choices for this kit weighing in at around the 600 gram range, the bobweight on this kit usually comes out to a very nice 2250 grams or so, depending on piston & rod choice. This kit is one of the easiest kits to put together, especially if this is your first stroker motor. For a low maintenance, high horsepower setup at home on the street as well as the drags, nothing beats the 440>>500 kit. Slight clearancing of the very bottom of the cylinder walls may be necessary. If you have a die grinder you can do this in your garage with no problem. This kit will almost always clear factory internal 3/8" and 1/2" oil pickups. We supply Clevite's "H" series champhered or narrowed bearings to help clear the larger radius on our cranks. See our Bearings page for details on bearing fit/function, etc. Upgrade to ARP2000 rod bolts: $99 This upgrades the standard ARP8740 bolts (which ARP rates up to 850 horsepower,) to ARP 2000 bolts, which they rate up to 1200 horsepower. Any flattop or dished Platinum series pistons (listed below) are included in the base price, there are no "extra charges" for dished pistons. We figure the ratios below with a standard .039" head gasket, which is the thickness of Felpro's popular #1009 Chrysler big block head gasket. All our pistons use the lighter and stronger .990" pins and 1/16, 1/16, 3/16 ring grooves. Low tension or standard tension rings can be used. Valve reliefs are generally good for about a .700" lift cam. The 4.250" stroke version of our Platinum Series crank used in this kit has the smaller 2.200" (big block Chevy sized) journals to make block clearancing much easier. In fact block clearancing for the 4.250" stroke crank with smaller rod journals is nearly the same as the 4.150" crank with Chrysler sized rod journals, making this kit hassle free to install, and almost a bolt in deal, just like our 440>>500 kit. This is the largest kit which is still able to safely use a factory style internal oil pickup. Now available for this kit is our new Platinum Series pistons setup for PUMP GAS. These 17CC dished pistons with give a perfect pump gas compression ratio of 9.5 with factory style cast iron heads. Or, with the newer 75cc aluminum heads such as Indy and Edelbrock Victor, a perfect 10.5 to 1, which is ideal for pump gas with aluminum heads. We supply Clevite's "H" series champhered or narrowed bearings to help clear the larger radius on our cranks. See our Bearings page for details on bearing fit/function, etc. We figure the ratios below with a standard .039" head gasket, which is the thickness of Felpro's popular #1009 Chrysler big block head gasket. All our pistons use the lighter and stronger .990" pins and 1/16, 1/16, 3/16 ring grooves. Low tension or standard tension rings can be used. Valve reliefs are generally good for about a .700" lift cam. Our two most popular pump gas 440>>512 kits, the 440.512.5060 and the 440.512.5070 are normally kept in stock pre-balanced, ready to ship out the same day for you. The 4.375" stroke version of our Platinum Series crank used in this kit has the smaller 2.200" (big block Chevy sized) journals to make block clearancing easier. This kit must sometimes use an external oiling system because of the large stroke, although many customers have been able to use an internal 3/8" stock pickup. A large selection of off-the-shelf pistons makes this kit a great choice. We supply Clevite's "H" series champhered or narrowed bearings to help clear the larger radius on our cranks. See our Bearings page for details on bearing fit/function, etc. If your race car trailer is bigger than your house, and the tires on your truck are taller than your significant other, than this is the kit for you. This kit takes a factory 440 block out to the maximum cubic inch limit. Any bigger and the rods will actually hit the camshaft. And the best part? We don't jack up the price! This big inch kit is the same low price as all the rest of our kits... even with our new high compression domed pistons, we don't charge a penny extra! It's all included. Whether you've got a tube chassis A body you're looking to rocket into the single digit ET's or a C body that weighs more than the Titanic, there's no replacement for displacement, and once you feel those 543 cubes under the hood, you'll agree. The 4.500" stroke version of our Platinum Series crank used in this kit has the smaller 2.200" (big block Chevy sized) journals to make block clearancing easier, however it's still a huge monstrous stroke, so expect to do some grinding on the block to get this one to fit. Because of the massive stroke, you may not be able to use the factory internal pickup, so an external line system may be required. Now available for this kit is our Platinum Series pistons setup for PUMP GAS. 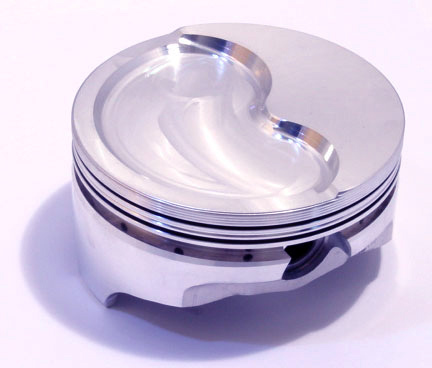 These 27CC dished pistons with give a perfect pump gas compression ratio of 9.5 with factory style cast iron heads. Or, with the newer 75cc aluminum heads such as Indy and Edelbrock Victor, a perfect 10.5 to 1, which is ideal for pump gas with aluminum heads. We keep all the kits listed below normally on our our shelf and ready to ship, usually within 24 hours! We supply Clevite's "H" series champhered or narrowed bearings to help clear the larger radius on our cranks. See our Bearings page for details on bearing fit/function, etc. We figure the ratios below with a standard .039" head gasket, which is the thickness of Felpro's popular #1009 Chrysler big block head gasket. All our pistons use the lighter and stronger full floating .990" pins and 1/16, 1/16, 3/16 ring grooves. Low tension or standard tension rings can be used. Valve reliefs are generally good for about a .700" lift cam. Turn that unwanted old 400 "smog" motor into one of the most awesome stroker motors you can build! You'll hardly be able to contain the massive torque and horsepower gained by adding an incredible 112 cubic inches to your 400 "B" block! The low deck, 4.250" stroke version of our Platinum Series crank used in this kit has the smaller 2.200" (big block Chevy sized) journals, and the counterweights are finished at the smaller "B" engine size, to ensure they will drop right into the block with no counterweight clearancing issues. Depending on the block used, many of customers find this kit drops right in with no modifications whatsoever! And now, we have flat top, domed and dished pistons available OFF THE SHELF, some in .035" AND 040" oversizes. If you have a 400 block that has already been bored .035" and needs to go to the next size up, it used to require a custom made piston. This meant hundreds of dollars extra and 4-6 weeks of waiting. We got tired of telling our customers there would be extra charges and a long wait, so now we stock 'em! And the best part? Any of the pistons listed below are included in this kit for our standard unbelievably low stroker kit price! Sure, we could easily jack up the price for the extra larger bore sizes or options like a domed high compression piston, but that's not what we're about. AND, we normally keep everything listed on our our shelf and ready to ship, usually within 24 hours. We now offer fully chamfered "B" engine main bearings as an available upgrade! 400 >> 500. (4.150" stroke/6.760" rod) Approximate Bobweight: 2075! This kit adds an incredible 100 cubic inches to your 400 "B" block, and ends up with some of the lightest components available for any stroker combination! The pistons included with this kit are only about 1.120" tall (that's barely more than half the height of a stock 440 piston at 2.065!) and will usually weigh less than 500 grams! Picking up a box of these pistons verses a box of regular pistons is a HUGE weight difference. You don't need a gram scale to tell which is which. The bobweight on this kit will usually end up in the 2075 gram range! Ever tap the throttle on a big block and have it rev as quick as a street bike? This kit includes our Platinum Series 4.15" stroke BRAND NEW FORGED 4340 steel nitrated crankshaft with profiled (rounded) counterweights, and original Chrysler sized standard/standard rod and main journal sizes (2.375" rods and 2.625" mains.) Beware of other kits where shops grind a 440 crank down to 400 size mains after manufacturing, because doing this will grind off the nitriding (hardening.) Our cranks are manufactured at the factory with 400 size mains, and nitrated AFTER the journals are ground. Counterweights are also finished at the smaller "B" engine size, to ensure they will drop right into the block with no counterweight clearancing issues. Rods are our superlight 750 gram H beam 6.760 rods with insanely strong 7/16" ARP bolts. Because the pistons in this kit are so short, the wrist pin is in the same area as the oil ring, requiring the use of oil ring support rails. We now offer fully chamfered "B" engine main bearings as an available upgrade! Shown below is our new premium American Made Platinum Series 24cc D-shaped dished piston for this kit, (part #6000) now available at NO EXTRA CHARGE! Normally kept on the shelf and ready to ship! And forget about paying extra for oil rail supports, we're now throwing them in for NO EXTRA CHARGE also!! This kit is a great choice for an engine that will see a lot of street use, but still make some serious power. The low deck, 3.915" stroke version of our Platinum Series crank used in this kit has the smaller 2.200" (big block Chevy sized) journals, and the counterweights are finished at the smaller "B" engine size, to ensure they will drop right into the block with no counterweight clearancing issues. Depending on the block used, many of our customers find this kit drops right in with no modifications whatsoever! We now offer fully chamfered "B" engine main bearings as an available upgrade! We keep all the kits listed below normally on our our shelf and ready to ship, usually within 24 hours! A classic stroker combination with a modern "all brand new parts" twist. Our 451 kit includes our Platinum Series 3.75" stroke BRAND NEW FORGED 4340 steel nitrated crankshaft with profiled (rounded) counterweights, and original Chrysler sized standard/standard rod and main journal sizes (2.375" rods and 2.625" mains.). Beware of other kits where shops grind a 440 crank down to 400 size mains, because doing this will grind off the nitriding (hardening. ), or even worse, use an original 40 year old factory passenger car crank, or even a (gasp!) cast crank. Our cranks are manufactured at the factory with 400 size mains, and nitrated AFTER the journals are ground. Counterweights are also finished at the smaller "B" engine size, to ensure they will drop right into the block with no counterweight clearancing issues. Rods are our superlight H beam 6.760 rods with insanely strong 7/16" ARP bolts. We now offer fully chamfered "B" engine main bearings as an available upgrade! We keep all the kits listed below normally on our our shelf and ready to ship, usually within 24 hours! This kit is now available with either flat top, dished, or even DOMED high compression pistons, all at NO EXTRA CHARGE!! Turn that docile factory 383 block into a fire breathing, pavement twisting engine of almost 500 cubic inches, and no one (even the car show judges) will ever be able to tell it's not a 383... until they go for a ride! The time has arrived to dust off those 383 blocks we've been leaving in the back of the garage all those years. Chrysler made 4 times as many 383's as they did 440's, and it's no longer necessary to dig up a 440 block to get almost 500 cubes! The low deck, 4.250" stroke version of our Platinum Series crank used in this kit has the smaller 2.200" (big block Chevy sized) journals, and the counterweights are finished at the smaller "B" engine size, to ensure they will drop right into the block with no counterweight clearancing issues. Depending on the block used, many of customers find this kit drops right in with no modifications whatsoever! We now offer fully chamfered "B" engine main bearings as an available upgrade! We keep all the kits listed below normally on our our shelf and ready to ship, usually within 24 hours! This kit takes a 440 crank and rods, and stuff's 'em into a 383. The result is a 438. This one's a high revving screamer (just like the factory 383's were - but our parts are light years ahead of the old factory stuff,) with all new parts capable of 1000+ horsepower. The low deck, 3.750" stroke version of our Platinum Series crank used in this kit has the counterweights finished at the smaller "B" engine size, to ensure they will drop right into the block with no counterweight clearancing issues. Depending on the block used, many of customers find this kit drops right in with no modifications whatsoever! We now offer fully chamfered "B" engine main bearings as an available upgrade! We keep all the kits listed below normally on our our shelf and ready to ship, usually within 24 hours! While not technically a "stroker kit" our 440 rotating assembly keeps all those classic big block dimensions while using parts that are light years ahead of all the old factory stuff. In fact, even if you're not going for big cubic inches, by the time you price out the labor costs to rebuild all your 40 year old worn out factory parts, it just makes sense (and cents) to go with our rotating assembly instead. The quality and value just can't be beat. Do the math and you'll agree! This assembly includes our Platinum Series 3.75" stroke BRAND NEW FORGED 4340 steel nitrated crankshaft with profiled (rounded) counterweights, and original Chrysler sized standard/standard rod and main journal sizes (2.375" rods and 2.750" mains.) Rods are our superlight H beam 6.760 rods with insanely strong 7/16" ARP bolts, and your choice of flat top forged pistons listed below. 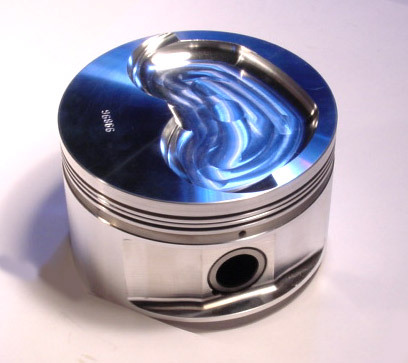 Dished pistons are available on a special order basis. Pistons for this kit are available in .030, .040, and .055 over. Full floating wrist pins are included as standard in the kit. We supply Clevite's "H" series champhered or narrowed bearings to help clear the larger radius on our cranks. See our Bearings page for details on bearing fit/function, etc. Listed below is a quick overview of the kits we offer, including other details such as the rod ratio, etc for each kit. We are "the stroker kit experts!!" No other shop even comes close to offering such a large choice of in-stock kits, including such high quality components, at an incredibly reasonable price! Call us for details or if you have any questions. Displacements calculated at .060 over (4.380") bore size. Displacements calculated at .035 over (4.375") bore size. Displacements calculated at .060 over (4.310") bore size. Average Bobweight is the exact mathematical average for each kit size, taken directly from the raw data of our balancing machine, which includes several thousand kits balanced over many years. Your actual bobweight, depending on the weight of specific components used, may be higher or lower. WARNING: Our stroker kits have been known to cause the following adverse effects, even when used properly: Please read this section fully before ordering. 1. Extreme tire wear, especially in the rear. 4. Increased dry cleaning bills, especially for underwear. 6. Learning to drive with tires boiling in all gears. 7. Unexplained smiling at the thoughts of taking your ride out next. 8. Plastic surgery bills to remove your "perma-smile"
10. Annoyed neighbors from loud exhaust, screeching tires, late night wrenching sessions, etc. If you experience any of these effects, please do not attempt treatment yourself. Do not call a medical professional for treatment advice. Proceed immediately to the nearest drag strip. Apply maximum acceleration repeatedly for 4-8 hours. Warning: This is only a temporary cure. You may find more frequent trips to the drag strip will become necessary. In test subjects, this behavior has been proven to become extremely habit forming. Frequent consultations with Visa and/or Mastercard may temporarily ease pain and suffering, however "the bug" will almost certainly return with increased intensity. If this happens, reapply Visa, Mastercard and drag strip, in that order. Don't say we didn't warn you! !